Decked out in their green NorthBay shirts, more than 200 NorthBay Healthcare employees, their friends, family and even a few pets assembled April 12 to participate in the 2014 Run for Good. The event, which benefits the Matt Garcia Youth Center and the Fairfield Police Activities League, was changed this year to include a half-marathon run, as well as a 5K, 10K and Kids Race. 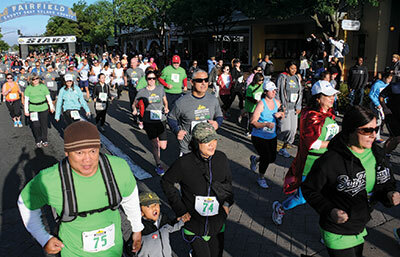 More than 1,000 runners and walkers participated, wending their way through downtown Fairfield—and in the case of the 10K—through downtown Suisun as well. Organizers say the event raised more than $30,000.